Why I can not use flash normally? I have enabled Flash in setting but it's not fixed. 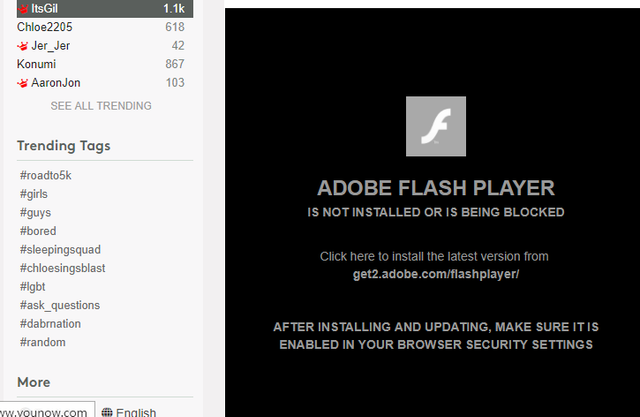 @lordarthas1995 Did you install Flash for Opera, ppapi Flash ? "Menu -> Settings -> Websites -> Flash". Set Flash to "Allow sites to run Flash" or add https://www.younow.com:443 to the exceptions list. I set "Allow sites to run Flash", but it's not work! You can try it by yourself. @lordarthas1995 I did and it works fine for me. I don't even see that Flash warning when going to the page in Opera. I just see an animated loading gif. I do see it in Vivaldi though, but adding the exception works. I don't need the exception in Opera if "Allow sites to run Flash" is set. Are you using Opera's VPN or Opera's adblocker? Any extensions installed? Does it show that Flash is working at https://get.adobe.com/flashplayer/about/ (don't worry about the plug-in blocked thing is the address field. Click and choose "run this time" if needed)? I use ADblock. I try disabling ADblock but it's not work. I have not use Opera's vpn. Flash does not work in https://get.adobe.com/flashplayer/about/ too. Did you go to https://get.adobe.com/flashplayer/ in Opera and download and install Flash? If so, maybe try it again. If it still doesn't work, download Opera again, launch the installer, click "options", set "install path" to a folder on your desktop, set "install for" to "standalone installation" and install. Try things in that Opera. Does it work there? @lordarthas1995 You're saying you uninstalled Opera and delete its profile files and reinstalled Opera and it works? If so, awesome. But, if it was an issue with your profile, we might have been able to fix it without wiping it out.